Online news has gone through many changes since its early days as a mostly text-based enterprise. Video and multimedia presentations are now standard fare on many top sites. But there is still room to innovate in the presentation of stories, audience debates and other information. For large news companies and individual bloggers alike, coming up with new methods of presentation to keep people coming back and stay longer is an ongoing goal. 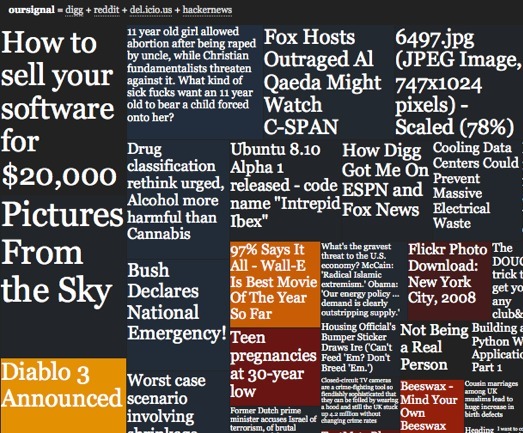 An intensely graphical display of news headlines comes from OurSignal, a mashup of social news sites Digg, Reddit, Delicious and Hacker News. 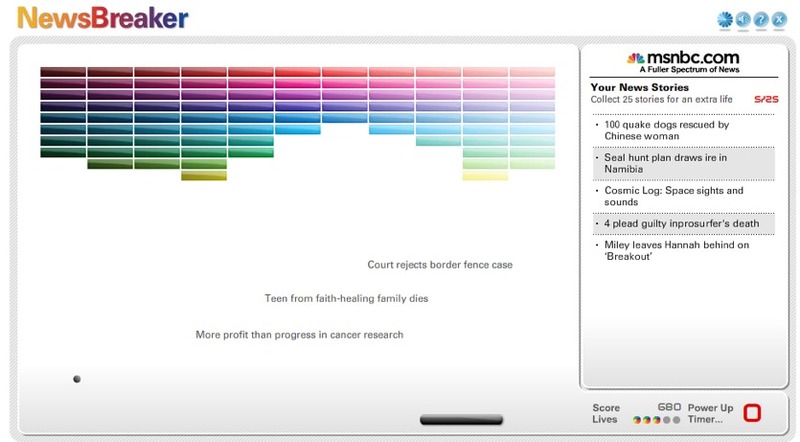 The headlines are arranged in boxes, which are categorized by color and presented at different sizes based on popularity. The site’s form follows its functional design , allowing you to quickly zero in on news breaking across this part of the Web. But who wants to read news, when you can play games? NewsBreaker is a RSS news reader disguised as a game of Pong. The site was designed by Fuel Industries, for MSNBC’s A Fuller Spectrum of News Campaign. It’s like a souped up game of Pong, except when you break blocks, headlines float down and are saved at the side of the game and can be read later. It’s an example of gaming (“funware“) spreading across the Web. Reading news can be fun. Who knew? This is just the beginning of innovation around news presentation and storytelling. For more interesting ways of visualizing the news, check out multimedia guru Mark Luckie’s take. He has examples of photo streams, live news cameras, map extravaganzas and other interesting designs and presentations. User Generated Content + News = ? City University’s Neil Thurman (U.K.) has an interesting study on the use of user-generated content by news companies. Is UGC the solution to the problems that many news companies face–such as declines in print circulation, and blogs and Google sniping at their heels? Engagement is important for these companies, as is building something that fits seamlessly into the existing business. First, from the audience perspective, how do audiences respond to “citizen journalism”? According to Thurman, the adoption has been slow so far. On a popular debate forum on BBC’s site, 0.5 percent of users contributed, which is lower than the average of 1 percent on many social media sites, noted the Guardian’s Jemima Kiss. However, news companies aren’t social media companies, and expecting them to have Facebook-like virality is expecting too much. It is still early days and many news organizations are trying to figure this problem out. Some have been working on it for a while. The Bakersfield Californian was an early tester of this model when it launched Northwest Voice in 2004–itself inspired by South Korea’s OhMyNews. Does user generated content add to news companies’ business? The question is probably better asked as, what is the best way for news companies to drive more traffic and keep readers on their sites? Of course, the business of news is different from that of a Disney or Scion, which are building communities to engage with their audiences around their brands. News companies are built on their reputation and credibility of their news. Mixing hard news with UGC news is a delicate matter. But it is a necessary issue to confront, increasing competition on all fronts. It can be done, and is completely necessary, a number of writers have argued. Interestingly, in the Thurman study, 80 percent of the methods used to engage users were using moderators and/or pre-editing all of the content. This seems to make it difficult for UGC sections of news sites to scale to the level of the the “professional” news portions of their sites. Either news companies will have to give in and do away with most editing of UGC (and let the misspellings and low quality postings in) or a company needs to come up with an automated solution to edit UGC. Moderated UGC sites are just too expensive, Thurman’s study found. There are a number of companies working on different aspects of socializing news, such as Mixx, Thoof, Digg and Reddit. Targeted Ads in Print: A New Revenue Source For Media Companies?